The Lenovo Yoga 730 is a versatile device that’s ideal for users who want it all: speed, portability, writability, and comfort. If only this sleek, lithe device had a lighter price tag. 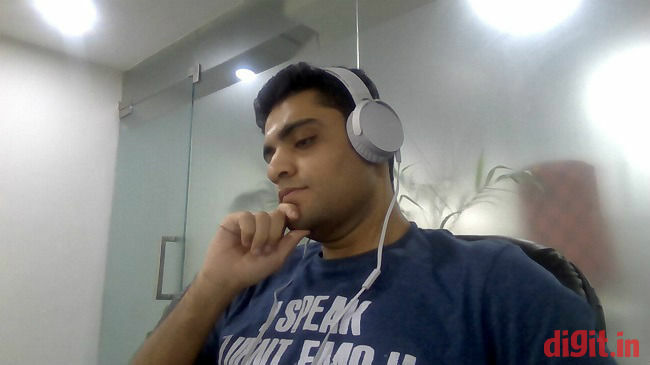 “The Lenovo Yoga 720 is essentially the convertible version of the IdeaPad 720s,” wrote Hardik Singh, my predecessor, in his review of the Yoga 720 earlier this year. If that’s what he thought about the Yoga 720 and the IdeaPad 720S, I wonder what he’ll feel about the Yoga 730 because visually, it is almost exactly the same as the the Yoga 720. So, what’s new in the current model then? Has Lenovo managed to shave some weight off its popular convertible? Are the changes all under the keyboard? Or are there any changes at all? Let’s find out. Though it might seem as if all Lenovo did was shove the Yoga 720 into a photocopier’s flatbed and hit copy, the Yoga 730 differs in one hard-to-notice aesthetic detail: the lid of the laptop is now a little shorter in height. So it sits flush with the front side of the base but doesn’t meet the rear side all the way. This makes the hinge look more slant and the laptop slightly easier to hold by that end. 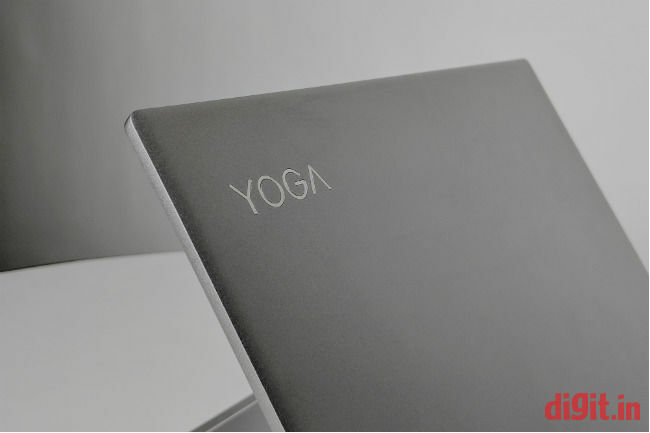 The aluminium cover on the outside and the Yoga logo on it seem to be the same. The lid has a matte finish and feels solid enough for that accidental scratch or graze. Don’t go throwing it around though. The base of the laptop is almost bare save for some grilles meant for heat dissipation. Weight is now down from 1.3 kilogrammes to 1.12 kilogrammes on the Yoga 730. Despite the weight loss, the laptop feels a little heavy in the hands, especially if you see how slim and compact it otherwise is. That said, it’s still a lot easier to carry than say, the hard drive-powered HP Pavilion x360. The lid is too tight to be opened with a single finger, but that’s not always a bad thing because it stands erect when it’s lifted and shaken about. Playing around with only one side of the lid doesn’t reveal any signs of flex, making the laptop pretty solid on the build front. The area around the keyboard and touchpad seems to be made of the same aluminium material and feels strong. Punching the keys on the keyboard does not show any signs of flex; good boy. Like its IdeaPad cousins, the Yoga 730 has a thin chrome-lined border around the touchpad for an added touch of class. The 5.9mm-slim bezels around the display seem to remain unchanged from the Yoga 720. All in all, the Yoga 730 seems to be built quite solidly for life at the desk and on the go. The Lenovo Yoga 730 comes with a 13.3-inch IPS LCD touchscreen with two display resolution options: UHD and Full HD. The review unit came with the latter. I found colours appearing accurately on it, rich even. Our tests showed that the display produced 95 percent of the colours on the sRGB colour scale and 73 percent of the colours on the Adobe RGB colour scale. The screen—which Lenovo claims can deliver up to 300 nits—appeared comfortably bright for indoor and outdoor areas. The brightness varied automatically with ambient light at a graceful pace, unlike the Lenovo ThinkPad X1 Yoga, whose brightness rose and dipped too frequently for comfort. The screen responded to touches with precision and palm rejection worked accurately when I felt the display palm-first. I was able to view content with sufficient comfort even when the display was folded flat and turned around in odd horizontal angles. Though colours continued to appear more or less the same, a reflection of the light around (including the keyboard light) formed easily on the display. It goes to show you can’t have it all. Along with the convertible laptop you get a Lenovo Active Pen 2 for Yoga. It eats a single AAAA before getting to work without drivers or setting up. In my experience, pen inputs happened naturally with no noticeable latency. 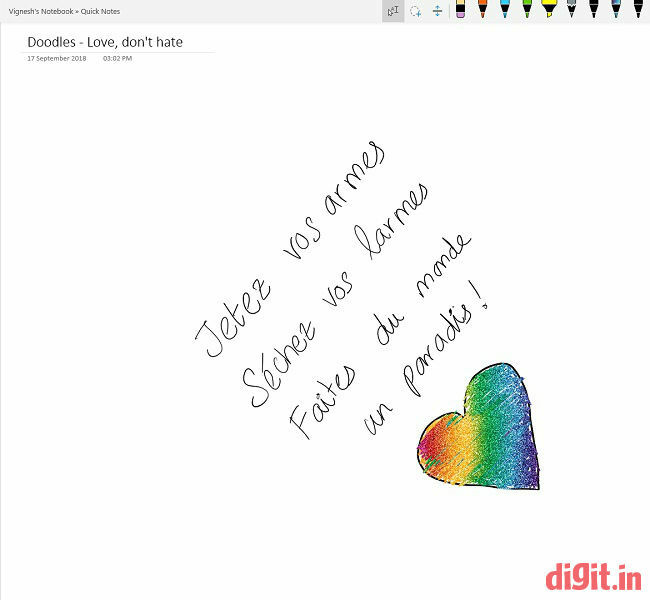 Drawing and writing was an easy affair on Microsoft Paint and OneNote. How good is it though? Now, I’ve seen thus far the best writing and drawing experience on the Microsoft Surface Pro, but this Yoga comes very close to that in terms of accuracy and latency. You can comfortably write on it as if it were a notebook. 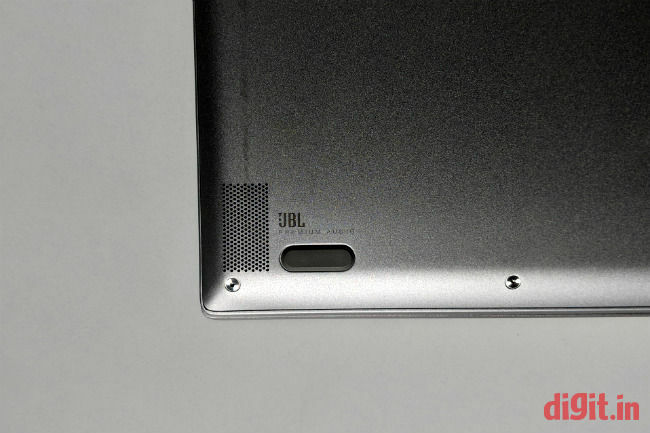 Despite the subtly etched JBL badge at the bottom, there was nothing special about the sound that emanated from the Yoga 730’s two tiny down-firing speakers. Maximum volume was just about enough for movie dialogues in a quiet bedroom of 24 x 24 feet. Bass output felt weak but vocals were heard clearly. As far as audio is concerned, you’re better off carrying a portable Bluetooth speaker if you want clear and loud audio on the go. The 720p camera on top of the display managed to produce images of reasonable quality. Colours weren’t particularly rich but the images didn’t look pixelated or grainy, as is the case with many laptop-camera images. If your laptop bag is loaded with dongles and peripherals, I have some bad news for you. Lenovo has not added any more ports to the Yoga 730. If it’s any consolation, Lenovo hasn’t removed any either. On the left side you get two Thunderbolt 3-capable USB Type-C ports and a 3.5mm jack for headsets. Mind you: on the Yoga 720, only one of the two USB Type-C ports had support for Thunderbolt 3. On the right side you see only one lonely USB 3.1 port. 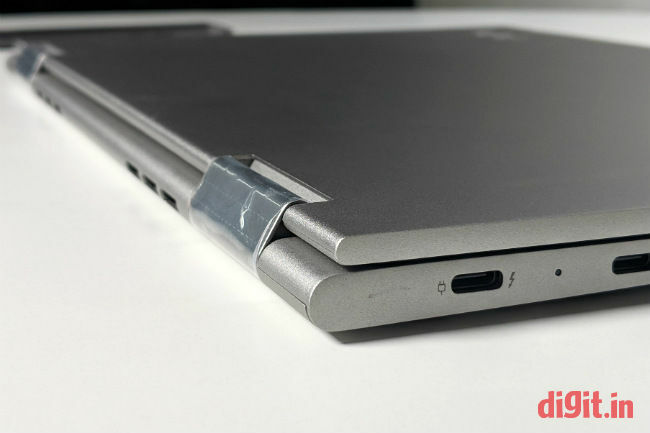 Lenovo has continued to place the power button on the right side so you can power the device on (or off) in tablet mode. The button is a little too soft and doesn’t provide enough feedback to tell if you’ve pressed it or not, but it’s nothing you can’t get used to. The keyboard is probably the most surprising element of the Lenovo Yoga 730. What with the device measuring only 14 millimetres in thickness, I imagined the two-stage-backlit keys to be shallow and lack feel, but I was happy to be proven wrong when I discovered they travelled deep and offered adequate amount of resistance. In fact, they were ideal for typing emails and documents all day long. In terms of travel alone, these keys offered more than the less-flexible, non-touch Lenovo IdeaPad 530S. I would have loved to see dedicated keys for Home, End, Page Up, and Page Down functions though. Touchpad experience on the Lenovo Yoga 730 was just as satisfying as the keyboard experience. The large matte-finished precision touchpad was easy to tap and swipe. Clicks were easy too even though the left- and right-click buttons lay beneath the touchpad surface. It being a precision touchpad meant that I could customise it completely in Windows Settings. Multi-finger gestures worked like a charm without missing a beat. All in all, the Yoga 730 scores high for its overall usability. The Lenovo Yoga 730 knocks only sixers in the performance department. Not only did the review unit perform admirably in our benchmark tests, but it also proved itself worthy for everyday use. The review unit was equipped with an Intel Core i7-8550U CPU, 8GB of RAM, and an integrated Intel UHD Graphics 620 GPU. Storage was taken care of by a Hynix 512GB PCIe NVMe SSD. Going through the BIOS screens revealed that the machine had two RAM slots available inside. This is good news for those looking to upgrade beyond 8GB in the future. 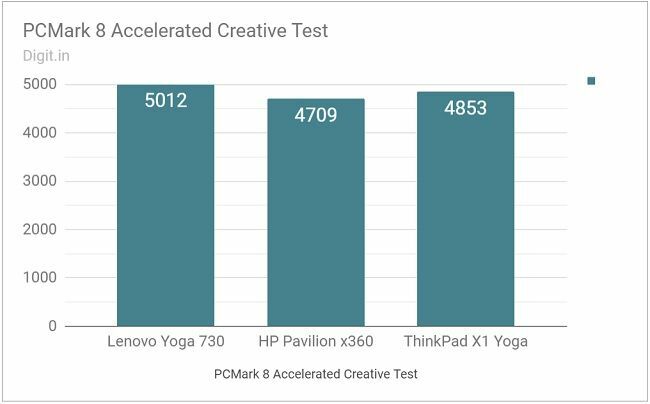 In PCMark 8’s Accelerated Creative test, the Yoga 730 scored 159 points more than the third-generation ThinkPad X1 Yoga and 303 points more than the HP Pavilion x360. It was a similar case with graphics benchmark tests like 3DMark’s Fire Strike and Ice Storm Extreme. 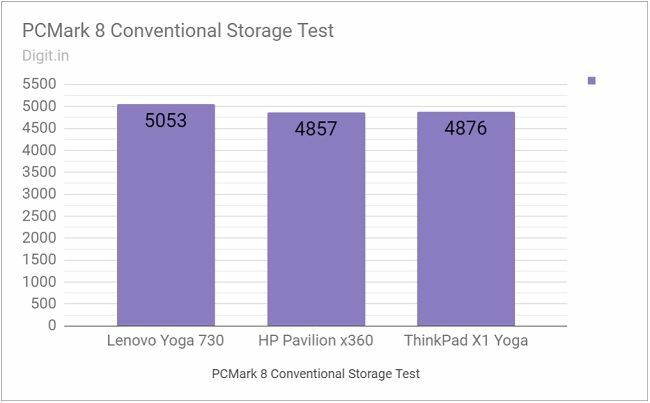 The sophisticated Core i7 CPU and the slick Hynix SSD ensured the Yoga 730 got a chart-topping score of 5053 in PCMark 8’s Conventional Storage test. In real-world-usage scenarios, the Yoga 730 performed just as admirably. The convertible laptop showed no signs of slowing down or freezing when I had over twelve applications open at the same time. I was able to keep over thirty Chrome tabs (with one tab constantly blaring music on YouTube), multiple Word documents, WhatsApp for PC, iTunes, WordWeb, multiple instances of File Explorer, and a few other light applications like Sticky Notes open simultaneously. I switched between these applications across three virtual desktops with a great deal of ease and the Yoga 730 showed no signs of sweat at all. There was that occasional moment when the animation while toggling windows slowed down by a few milliseconds, but I chalked that up to the fact that the Yoga 730 employed no dedicated GPU. Heat, for the most part, is in check on the Yoga 730. However, there are occasions when the quad-core Core i7 runs hot—app installations and intense browsing with over twenty Chrome tabs, for example. On these occasions, the base of the laptop gets quite warm. But that’s alright because you can’t really feel it. What’s not all right is the keyboard area, which transmits enough heat through the area between the keycaps to make typing and resting your fingers bothersome. If compared with the HP Pavilion x360 and the ThinkPad X1 Yoga, the Lenovo Yoga 730 sits somewhere in between but performs more like the ThinkPad X1 Yoga, thanks to its capable processor and slick solid-state drive. All things considered, performance is right up there on the Yoga 730. The Lenovo Yoga 730 trades in battery life for quick CPU times. With the brightness turned all the way up, twenty odd tabs open in Chrome, Bluetooth and Wi-Fi enabled, and music playing through wired headphones, the battery dipped from 100 to 57 percent in 1 hour, 45 minutes. With the music off and the brightness lowered, the battery dipped from 100 to 75 percent in one hour. On our benchmark test, the battery lasted 2 hours, 37 minutes. Charging from near zero to full charge took about one and a half hours when the laptop was turned off. Through all the tests, the Yoga 730’s battery did not last over 5 hours on a full charge. This sort of battery life is pitifully short for a device that’s meant for a life on the go. The device’s touchscreen no doubt is a contributor to the drain. Your best bet to get over 5 hours from this device is to lower brightness and turn radios off. One thing’s for sure: the Lenovo Yoga 730 is definitely worth its salt. It achieves a fine balance between power and portability. It comes with a comfortable keyboard and touchpad setup. The display too is colourful and bright. This makes the Yoga 730 an ideal device for somebody who is into frequent note-taking, browsing, and writing, but doesn’t care too much for ports and heavy graphics. What I’m not sure about is its short battery life and steep price tag. The Yoga 730 manages five hours (and occasionally a little over it) and starts at nearly a lakh rupees, which is at least 25,000 rupees costlier than the HP Pavilion x360. The extra money is worth it if you want a Microsoft Surface Pro with the keyboard and stylus, only newer and more substantial in terms of hardware and performance.